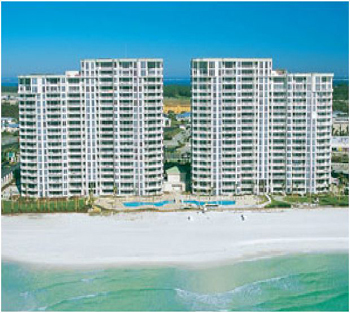 Destin's newest resort, Silver Beach Towers, is perhaps the finest location on the Emerald Coast. A beautiful beachfront complex, enjoy classically elegant vacationing in an upscale environment. Enjoy all of the amenities of Silver Shells Resort, such as the European-Style Luxury Spa, fine dining at the Grille/Restaurant, a workout at the fitness center, or just relaxing by the lagoon pool. Silver Beach is located in close proximity to restaurants and family entertainment. Exceptional accommodations, marked by unique design, that offer superior, quality furnishings, luxury features, designer appointments, and top of the line kitchens, baths and amenities. The information provided, though deemed accurate, is not guaranteed, it is subject to errors, omissions, change of price, or withdrawal without notice. Contact the reservation office at the phone number below for current information. …and say you saw Unit 605E on the DestinFlCondo website.